Here’s a WCYDWT for Alberta’s Math 10-3 on Ratios and Rates. This fish, a 60 pound sturgeon, was recently caught and released in a small self-contained pond on a golf course near the Red Deer River. When local biologists heard about the catch, they decided to investigate. They surmise he (or she) came into the pond when the river flooded five years ago, and then spent the next five years feeding happily on the stocked trout. 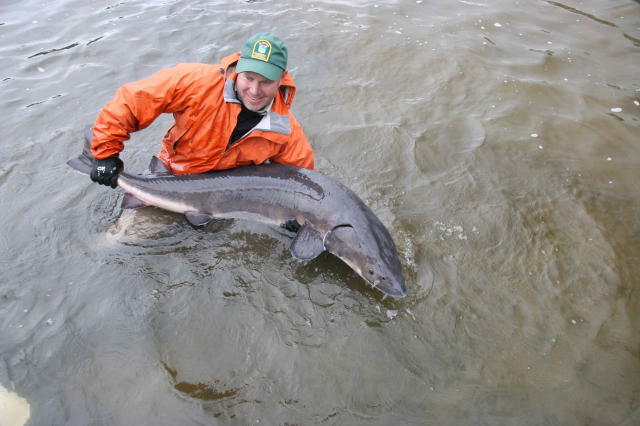 Since sturgeon are endangered, it was important to return him (or her) to the river, which they were able to do. This story reminded me that about ten years ago, I was fortunate enough to be present when a team of biologists surveyed a cutthroat trout population on a remote mountain stream. Biologists typically use a method called electroshock fishing to stun fish so they can be tagged and released. They had a boat with a generator on it and a long metal prod which they poked around in the water. When the current got near enough to a fish, it would be momentarily stunned, and float to the surface. The biologists then weighed, measured and tagged the fish before returning it to the stream. Any fish that had been previously tagged had its number recorded and it was again weighed and measured. It was a humbling experience to see that there were actually abundant numbers of fish in that stream, because I had been unable to catch any earlier that day with my fly rod, but I digress. I have used the story of watching the biologists electroshock fish several times in my classes as a ratio problem and asked students determine the population of fish in that stream. Sometimes I gave my students the number of fish tagged on the first day, and then the number of tagged fish caught on a second run of the same stretch of river later on. Other times (and probably a better problem), I had my students design an experiment to predict the population of fish before providing them the actual numbers.